This garden inspired bracelet is created using seed beads and a variation of a Russian Leaf Stitch (diagonal peyote). Previous peyote stitch experience will make this pattern easier to follow; we recommend it for intermediate level beaders. This pattern makes a bracelet that can be any length between 5" and 9". 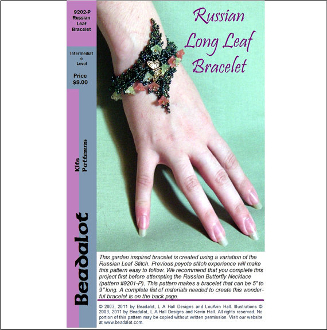 A complete list of materials needed to create this bracelet is printed on the back cover. You will need 11/0 seed beads, Delica beads (or other cylindrical beads), a butterfly shaped bead, 2 3-to-1 connectors, jump rings, a clasp, pressed glass lily shaped flowers, nylon thread or Fireline and beading needles.